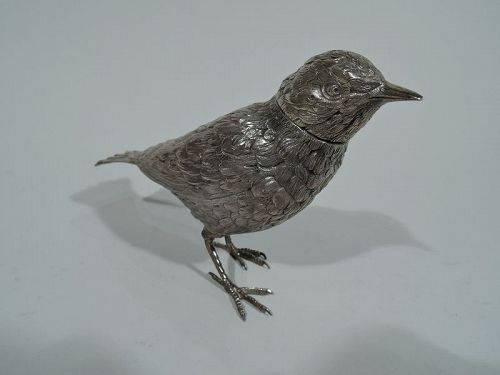 Dutch 833 silver figural box, 1927. Sweet and small bird with firm downy body, wide erect tail, and scaly talons. Head detachable. Fully marked including date letter and export symbol. Very good condition with deep patina. 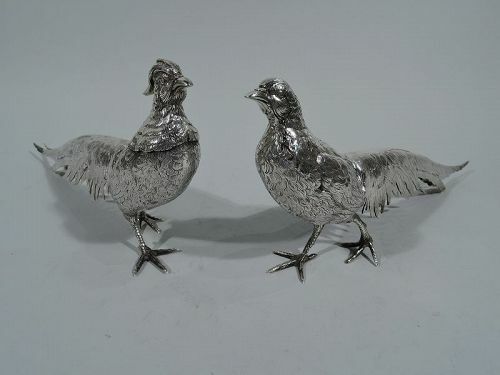 Fine pair of German 830 silver pheasants, ca 1910. A male-female couple with downy bodies, long tails, upright busts with alert heads, and scaly talons. The male has an impressive crown and neck ruff. Hallmarked. Very good condition with nice patina. 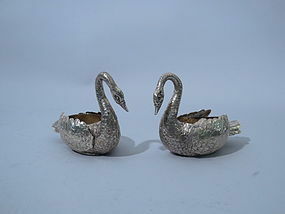 Pair of German 800 silver swans, ca. 1900. Each: Ovoid and hollow body with, vertical tail feathers, and curved and tapering neck terminating in pointed bill. Fun table ornaments. Can be filled with treats. Wings are hinged for dramatic display. 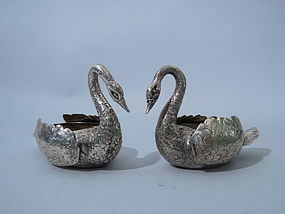 Pair of German 800 silver swans, ca. 1900. Each: Ovoid and hollow body with vertical tail feathers, and curved and tapering neck terminating in pointed bill. Fun table ornaments. Can be filled with treats. Wings are hinged for dramatic display.